at their individual level of need. The creation of the Seniors Village is a major commitment on the part of the Perley Rideau organization in support of the province's Aging At Home strategy to find innovative ways to serve the growing number of seniors in the community in a cost- effective manner. The strategy focuses on the needs of seniors for housing choices, access to services, social interaction, and meaningful activities. The up front investment for Perley Rideau is over $42 million - see funding details. 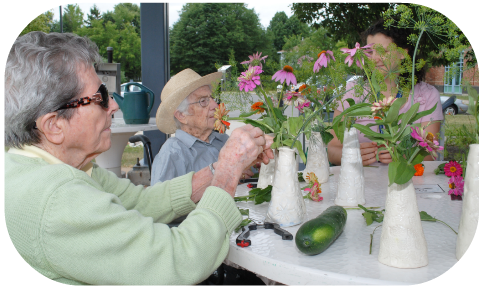 View Perley Rideau Seniors Village Videos! Assistance to seniors in their homes, complemented by a variety of programs provided on the Perley Rideau premises, including the Day program, and Guest House. Also planned is a Seniors’ Primary Care and Wellness Centre that will give access to primary care physicians. Specially designed apartments for independent living on the Perley Rideau property, with Assisted Living Services provided as needed and access to the same programs as if seniors were living in their existing homes. Health Care Centre with programs for long-term care, with specialized behaviour programs, and short term care, such as convalescent and respite care. All programs and services are overseen by a team of health care professionals. Programs and services are complemented by recreational activities, green spaces and a variety of other amenities for the convenience of the tenants at the seniors’ apartments, as well as the residents at the long-term care home. Family and friends are welcomed and encouraged to be involved in the lives of the residents, directly and through the Family and Friends Council of The Perley Rideau. For more information, see the following Q&As. You may also wish to review the most recent edition of our publication The Perley Rideau Seniors Village which sets out our strategy in more detail and the current edition of our Report to the Community.